Give your garden a triple colour boost just when it needs it the most. One of the nation's favourite early spring plants, Camellias are, when given the right conditions, very straightforward and problem free. Providing fabulous displays of flowers when almost every other plant is still asleep for winter, they’re ideal for providing a bold splash of colour when the garden is quite drab. Fabulous when grown in pots as they can be moved to any part of your garden for an instant colour lift and as they are evergreen, their neat, shiny leaves will provide a backdrop to other plants all year. 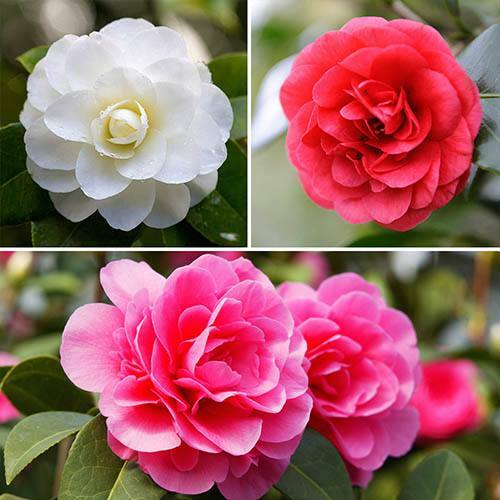 The key to success with Camellias is they need acidic soils - like Rhododendrons. This means they can easily be grown in pots in ericaceous composts. Supplied as 3 plants, one each of red, pink and white (flecked pink), 20-40cm tall and in bud. Providing fabulous displays of flowers when almost every other plant is still asleep for winter, they’re ideal for giving a bold splash of colour when the garden is quite drab – plus they’re fabulous in pots where they can be moved to any part of your garden. The key to success with Camellias is they need acidic soils - like Rhododendrons. This means they can easily be grown in pots in ericaceous composts, and provided they are fed with specialist ericaceous feed, will provide many years of colour and interest. They are evergreen, and their neat, shiny tough leaves will provide a backdrop to other plants all year. Flower buds start swelling late the previous summer, and keep getting bigger all autumn and winter, until they burst open in early spring. The flowers can be caught by frosts when they are opening, but the buds are generally fine, and the plant is 100% hardy and tough. Supplied as three plants, one each of red, pink and white flecked with Pink, 20-40cm tall and in bud. Supplied as 3 x established plants in a 5L pots, 20-40cm tall in full bud ready to burst into flower. 1 each red, pink and white with pink flecks. Container-grown plants will need protection in winter.